My first digital SLR camera was a Canon 400D, and my second was a Canon 40D. I recently upgraded to a Canon 7D. For at least six months it was in the back of my mind to upgrade from the 40D, but I didn’t know what to get so I started keeping an eye on the current Canon (because that is where I have invested for lenses) offerings in the form of articles and occasionally looking at the retail and eBay prices. It quickly became clear that my choice would be between the Canon 60D or the Canon 7D. The 60D is in the same range as my 40D, while the 7D is by itself in between the 40/50/60D range and the full frame 5D mark II. So how did I decide on the 60D or the 7D? Price: +1 for the 60D as it is cheaper. Video or still photos: +1 for the 7D as a number of different reviews noted that the 60D is better for video, while the 7D is better for still photos. As the 40D doesn’t have video and I have no plans to start shooting video, the 7D get the point. Storage: +0.5 for the 7D as I could keep using my Compact Flash cards instead of having to replace them with SD card. Buttons and controls: +1 for the 7D as it retained the wheel and joystick that I like from the 40D, while the 60D has dropped that in favour of the direction pad from the 600D. Based on the above, I started looking around for a 7D. It is unlikely I will ever again buy a camera at Australian retail prices, so it was off to eBay to keep an eye on the prices the grey imports were selling for and I also kept an eye on the secondhand listings. In the end it was a secondhand camera that I bought for a very good price for a one year old camera in excellent condition. So far I have used it at the Point Cook Air Pageant in late February and then over the Labour Day weekend while down at Lakes Entrance with the camera club. The only negatives so far have been that the image files have doubled (but so have the megapixels) and that slightly more sharpening is required in post processing. I have been able to adjust to the 7D very quickly because I came from the 40D and the interfaces are very similar. Apart from changes in the menu (which I don’t go into very often anyway), the biggest change I notice is that the power switch and preview button are in differnt location. However another club member also has a 7D, but they came from a 350D so they are having to learn a completely different interface. It is this button/switch layout that makes me think that the 7D is actually the successor for the 40/50D, not the 60D. I would then say that the 60D is the successor to the 550/600D. This is confirming to me that I made the correct choice with the 7D. While there are no set subjects for the monthly competitions at the camera club this year, there are two competitions where the entries must be submitted in monochrome. What this ends up meaning for me is that I look through my photos for ones with textures or patterns, and then convert them to monochrome. 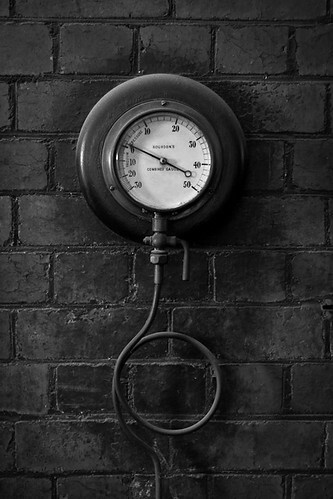 The first of these is a version of an image that is currently up on my wall, one taken at the old Spotswood Pumping Station. I tried to bring out the patterns made by the brickwork and also brightened the dial as it was looking washed out. My second image was from a day trip down to the Mornington Peninsula on ANZAC day last year, a day where heavy fog covered Melbourne and the surrounding area all the way to Hastings. 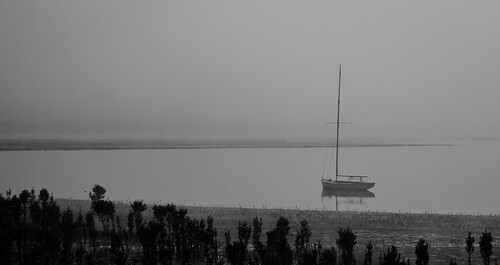 This foggy image was almost monochrome to start with. My third image was from my recent trip along the Great Ocean Road over the Australia Day weekend where I captured the silhouette of a bicycle rider. It is the perspective that makes them seem out by themselves, and I hoped to enhance the textures in the clouds in monochrome. 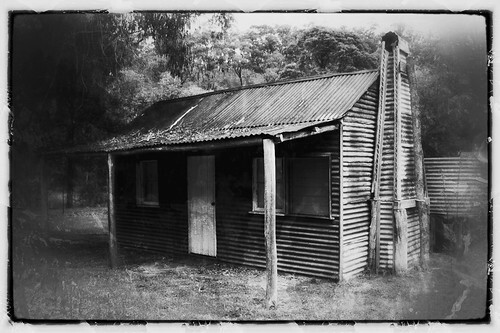 My final image (which recieved a merit) was taken of an old shack in Jamieson (near Lake Eildon) and much of the processing was done while experimenting with Snapseed on another club members iPad.